Sony pulled its controversial film "The Interview" after public threats, but one activist group hopes it can drop copies of the film into North Korea from the sky. 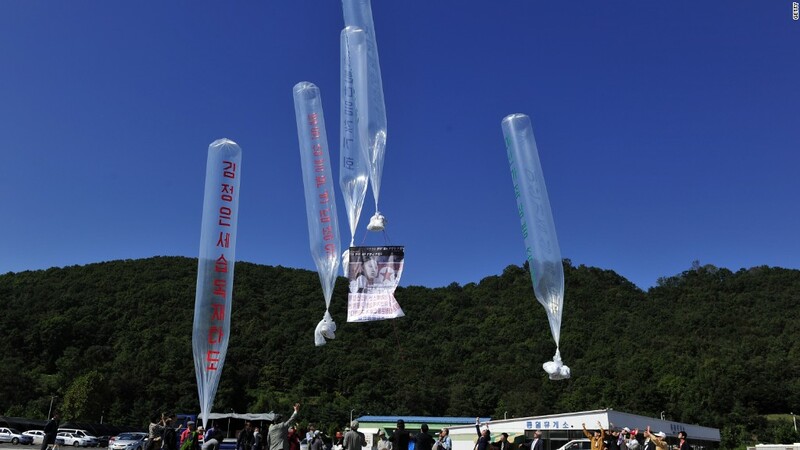 For the last two years, the Human Rights Foundation has been working with groups in South Korea to drop balloons into the North that are filled with banned items. HRF has teamed up with Park Sang Hak, who worked for the North Korean government before defecting to South Korea. He is now the chairman of an activist group, Fighters for a Free North Korea, and has successfully led multiple balloon launches into North Korea. Park told CNNMoney it's a wider effort to help North Koreans gain access to different perspectives. And that perspective may soon include the controversial film that North Korea has condemned. "If we can legally obtain copies of 'The Interview,' we want to send as many copies as possible," Halvorssen said. Previous balloon drops have included colorful items: copies of Bravo show 'Real Housewives,' films starring Arnold Schwarzenegger, chocolate, USBs with offline versions of Korean Wikipedia and American dollar bills. While the items are considered contraband in North Korea, there's a black market for the material. "Remember, there is no Internet in North Korea, there are no phone lines that can reach other countries," Halvorssen said. "It's life known as the 'hermit kingdom'." Actors in "The Interview" have been in touch and are encouraging of the effort, Halvorssen says. The next balloon drop is set for January. --CNNMoney's Hannah Bae contributed to this report.